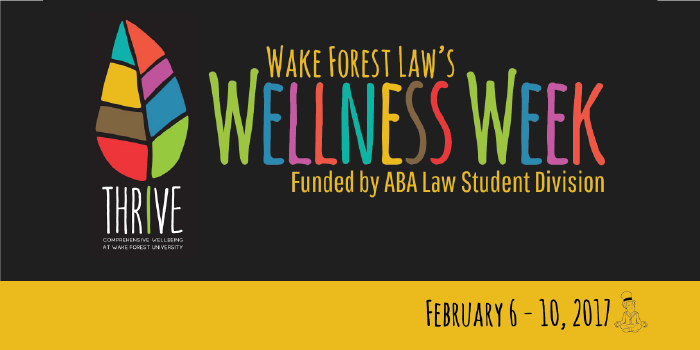 The Student Bar Association (SBA), the student government body of Wake Forest Law, will highlight resources for practicing self-care through its inaugural Wellness Week beginning Feb. 6-10, 2017, by addressing a different facets of mental health and well-being each day from 12 to 1 p.m. in the Law Commons and beyond. Thanks in part to a grant from the American Bar Association (ABA)’s Law Students Division and support from the Dean’s Office and the Office of Career and Professional Development, Wellness Week is part of a comprehensive plan to create at Wake Forest Law a culture and community that promotes mental health, well-being and self-care among its students, SBA President Grace Sykes (JD ’17) said. The new program takes a holistic approach to caring for students’ mental health with each day focusing on a different aspect of well-being. Throughout the week, representatives from various organizations, offices and local businesses will be available at tables in the Law Commons to help provide information about the services they offer and resources available to students for maintaining and improving their well-being. For the week’s capstone event, licensed psychologist Dr. Gary Glass, Ph.D., will give a special presentation, “Hints for Happiness: How to Manage Self Care in Law School,” from 12 to 1 p.m. on Thursday, Feb. 9, in the Worrell Professional Center, Rooms 1312 and 1310. In addition to providing tips for personal stress management, Dr. Glass will teach attendees how to recognize and relate to those suffering from mental health conditions, creating a community that is both empathetic and supportive.